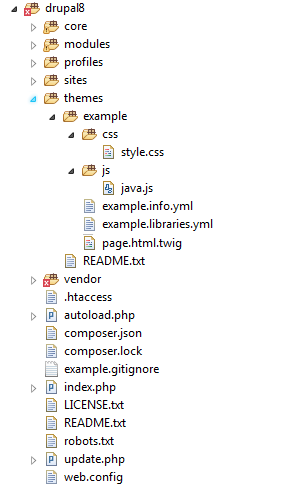 The following keys provide meta-data about your theme, and define some of the basic functionality. Required. The human readable name will appear on the Appearance page, where you can activate your theme. description:(eg:- This is sample theme for Drupal 8 🙂 ). Required. The description is also displayed on the Appearance page. Required. The type key indicates the type of extension, e.g. 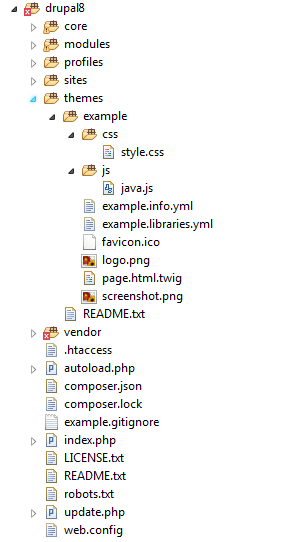 module, theme or profile. For themes this should always be set to “theme”. Required. The core key specifies the version of Drupal core that your theme is compatible with. The libraries key can be used to add asset libraries — which can contain both CSS and JS assets — to all pages where the theme is active. Regions are declared as children of the regions key. Note that region keys are not preceded by a dash. You are required to have a content region. You can write your own css file and js file, and also you can create your own favicon.ico, logo.png that are i am not adding here .